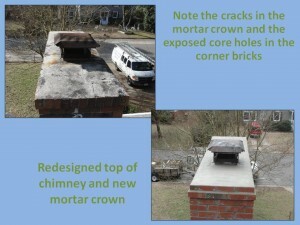 A chase cover or top pan is generally referring to the metal pan that covers the top of the chase of a prefabricated fireplace. 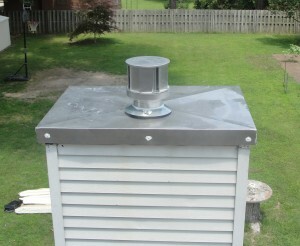 It is important to have a sturdy stainless steel chase cover that is fabricated specifically for your chimney. At Black Goose we replace existing top pans with a shop formed heavy gauge stainless steel pan. We will come to your home and measure the existing pan. We take the measurements to our sheet metal fabricator and he custom makes each pan with welds on the seams. It is important to have a chase cover that will not leak. The chase cover protects the prefabricated fireplace box and helps prolong the life of your fireplace.